Anyone that has ever installed Christmas lights has no doubt run into the problem of having one light bulb fall out of the line causing the whole set to go out. While the problem of one bulb burns out the whole set goes out is no longer much of an issue, outages caused by missing bulbs continues to be a problem. Unfortunately even with LED Christmas lights, this is still a recurring problem. While it's rare for a LED bulb to burn out, it is still fairly common to have a bulb come loose in the socket. Example of One Piece LED Lens and Socket Design Because of the long bulb life for LEDs, many better quality LED light sets are now manufactured with a one piece bulb and socket construction. This prevents a bulb from coming loose and falling out, which then causes anywhere from half to the whole set to go out. Another advantage of the one piece construction is that it significantly reduces the amount of moisture and debris that gets into the lighting system, which in turn greatly extends the life of the light sets. Many people get nervous when they find out that a bulb cannot be changed if it goes out. But it's important to note that even with a bulb burned out, the light set will still function without a problem. Through our testing we've found that one piece bulb and lens light sets will last two to three times longer than the removable bulb sets. The failure rate on these sets is extremely low which is the reason why you generally find one piece construction used on professionally installed jobs. Example of a hybrid design. Combines the best features of the one piece and two piece light sets. Most retail grade LED lights you buy at your local retail store are made using a two piece bulb and socket design. The average homeowner is very hesitant to buy a light set without removable bulbs, so it's unlikely the big chain stores will ever offer the high grade one piece light sets. Even the commercial line that is offered at Home Depot and is manufactured by GE still utilizes the removable bulbs and is prone to significant failures. 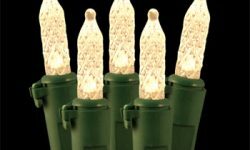 While the two piece light sets do cost less than the one piece, ultimately on a per year basis, the cheaper sets will cost you more money. Retail Grade sets will last 2 to 3 years, but better quality sets with one piece bulb and lens construction will typically last 6 to 7 years. So by spending more upfront, you'll have a light set that is much less prone to outages and will last 2 to 3 times longer. One other question we frequently get asked is how long do LED bulbs really last? This is closely related to the type of bulb/lens design and the answer does depend on whether you are going with a one piece bulb or two piece design. Because a one piece bulb is completely sealed up and non-removable, they tend to last far longer than the light set and it's very rare for one to go out. At the end of your light set's life, chances are, every bulb will still be fully operational. The failure of the light set generally happens because of wear and tear from installation and take down or wear and tear from harsh winter weather conditions. So while the light set itself will fail, it's not common for individual bulbs to go out. When it comes to two piece LED bulbs, since moisture and debris can get affect the base of the bulb, which tends to cause the bulb to fail, having an LED bulb go out is relatively common. Fortunately, even with a bulb that has failed, electricity still will typically pass through the set and the other bulbs will continue operating. 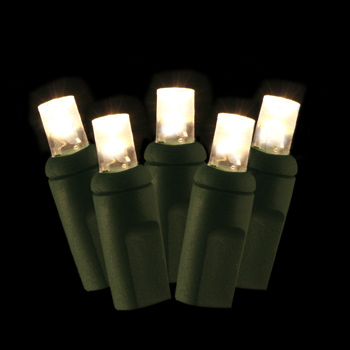 As a seller of higher grade LED Christmas lights, our recommendation is to go with the one piece LED Christmas lights. 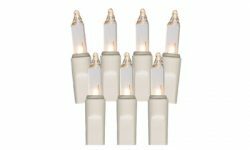 These sets will give you the best light for the money and will hold up much longer than the less expensive two piece light sets. While we do stock a limited selection of the retail grade two piece lights, we get a lot more favorable feedback from customers that spend a little more money upfront and purchased the Pro Grade light sets. In addition to a much better bulb design that utilizes the one piece construction, they also have better made components and solid construction that help it to withstand the rigors of professional lighting projects, but also work equally well for residential use.